However, when Doug dropped by my site and left lengthy comments about the pipeline and oil sands pollution, he didn’t mention that he worked for the oil industry. But his testy comments made me curious… using his name and email address I quickly discovered that he’s a “somebody” in the oil and gas industry, with 25 years under his belt and extensive regulatory experience. He’s been an expert witness at National Energy Board hearings, and also in Quebec with respect to “pipeline consultation thresholds and practices”. 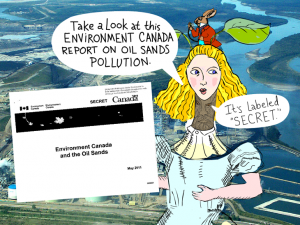 Anyone who has been paying attention to environmental issues in Canada knows that things have gotten downright toxic between the Harper Government, the oil industry, environmentalists, First Nations and even local communities. Our once peaceful country is rife with anger and resentment. We are no longer a nation at peace. Canada is in conflict. The government is waging war on the environment. …to solve the conflict, I suggested we need to have everybody at the table to work out the problems of how to develop the oil sands in a way that is respectful of the environment and human rights. Six months ago — as tensions rose across Canada with Minister Joe Oliver calling environmentalists “radicals” for opposing the Northern Gateway Pipeline, I tried to imagine a solution. 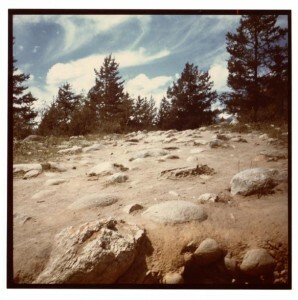 How can we develop our natural resources in a way that is respectful of the environment and all of the stakeholders? The “radical” idea I came up with is an Oil Stewardship Council (OSC) which would be based on the Forest Stewardship Council. (FSC helped to bring an end to the War in the Woods!) It would be a member-based, third-party audited certification system which would have four groups: oil industry, environmental, First Nations and local communities. The government is not involved in the FSC, and would not be involved in the OSC (which might make them a bit peeved, but I did raise the issue with Joe Oliver in March and he hasn’t shown any interest). Two aspects of FSC which I was most impressed with are 1) how they make decisions, and 2) how they audit. They make decisions by consensus. That means they share power equally. No group has more power than the other. The other savvy fact is that their auditing system does not rely on “trust”. Each group has their own auditors to make sure that the other guys are doing it right. So, I’m throwing this idea open for discussion. The seed came from a project I worked on in the Fall of 2010. 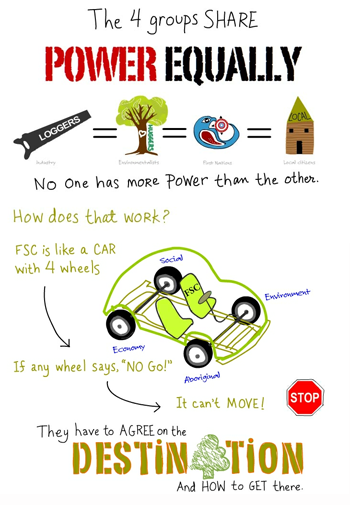 The Forest Stewardship Council Canada asked me to write a “personal” story about the FSC system. I traveled to the Boreal Forest, interviewed people from Tembec, First Nations, local communities and eNGOs (WWF and Greenpeace). I created an illustrated essay, and an animated video called “Who cares about the Forest?” It was published in the Spring of 2011. It has been very popular, and is currently being translated into Swedish. The fact is — we all use oil and will for some time to come. I personally buy green energy from Bullfrog Power, and we don’t own a car — but the reality is that everyone in North America uses oil daily because so much of our modern society is (still) dependant on oil. So what can we do to ensure that the extraction is truly respectful of the environment and human rights? Is a multi-stakeholder consensus-based oil certification system possible? What would it take to bring stakeholders from the oil industry to the table with environment, Aboriginal groups and local communities? Can an extractive industry be “respectful” of the environment, human rights, Aboriginal rights and worker’s rights? I called Antony Marcil, former CEO of Forest Stewardship Council Canada to ask him what he thought of the idea of an Oil Stewardship Council. He wrote to me…. 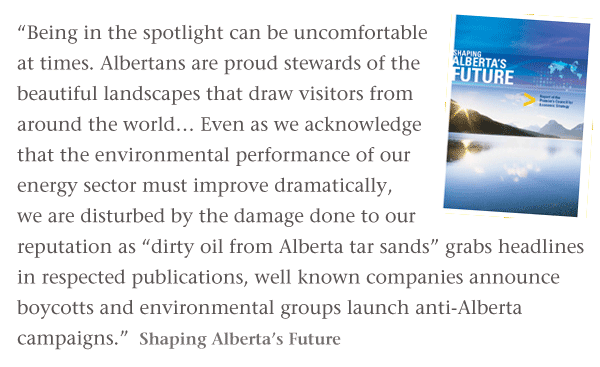 But will they miss the clean tech boom shift because of their love affair with the oil sands? Ed Whittingham, Executive Director, Pembina Institute thinks that is a definite risk. You don’t need to live in the province to be concerned and speak up. I’ve even slept with an oil rig worker! Can Ford’s comments be a springboard? But as I stepped back I realized, Doug Ford is just doing his job –- defending the interests of Enbridge Northern Gateway, Kinder Morgan, and his other “Big Oil” clients. 1. Pipelines are not, as Doug claims, “99.9%” safe: In the last month a “million litres of oil has spilled in Alberta” forcing Premier Redford to look harder at a safety review of it 377,000 kilometres of pipeline. Stephen Hume in the Vancouver Sun notes that in the past six years, Alberta’s pipelines have spilled a whopping 28 million litres of oil. And in the period from 1990 to 2005 there were more than 16,000 pipeline spills, euphemistically called “releases” by the industry. 4. Aging pipelines present real risks. 5. The pollution in the Athabasca River is a high profile concern. 6. Government emails admit that many species are at risk from the Gateway Pipeline: Endangered populations of woodland caribou, along with rare types of birds and frogs, are among a list of at least 15 species that face threats from the potential construction of Enbridge’s proposed Northern Gateway pipeline from Alberta to British Columbia, reveals newly released government records. 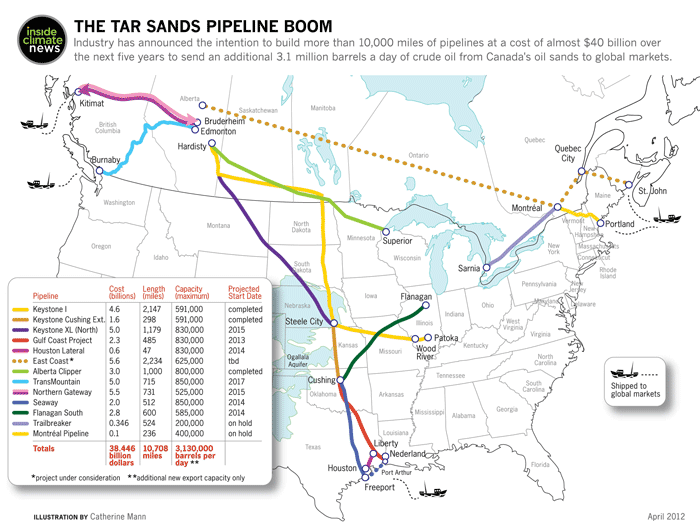 The Northern Gateway is designed to transport far more crude than we’ve been led to believe. Robyn Allan, former president of ICBC, says that the pipeline could carry 60 per cent more than now proposed, resulting in hundreds more tankers off BC’s coast. As we can see from the pipeline boom map, Alberta has big dreams to distribute its oil to Asia and throughout North America. But that big plan is at risk. Canada is seething with anger. People’s rights are being disrespected. There is a dangerous “us versus them” mentality which pervades the current Conservative government. Scientists and Environmentalists are just as angry as First Nations. Scientific facts about air and water pollution are being silenced (or not even collected) to protect “oil profits”. Valuable science research is being cancelled because it is yielding data contrary to the government’s wishes. Environmental charities are being attacked for “doing things contrary to government policy”. At the end of the day, “power” is really the issue. Most of these disagreements over resource development could be solved if there was mutual respect. And by mutual respect, I don’t mean lip service. I mean sharing power equally. The Harper Government has changed the rules in favour of oil and gas development. Unfortunately that use of top-down power to exert control and repress voices is strangling our democracy. His use of power to quell dissenting voices and suppress scientific information is making enemies from coast-to-coast. 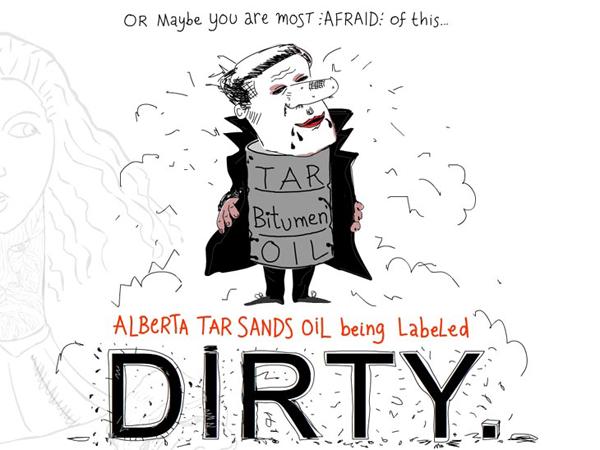 The oil industry should be afraid of Harper. It would be much better served by doing the right thing – irrespective of the government’s carte blanche for resource development. I’d like to call on the “Doug Ford’s” and others in the oil industry to do something remarkable. Step forward. Show us some leadership. * Note: the letter count is being updated continuously. When Doug Ford first made his comments on June 20/12, the letter tally was at 6,872. Forest Stewardship Canada: Who cares about the Forest? Farmers and ranchers are bearing the cost of aging, unsafe pipelines. If Enbridge says there pipelines are 99.9% safe, why will they not publish their design data for the Northern Gateway pipeline? MTBF: Mean Time Between Failure: is an engineering calculation used to evaluate the quality or reliability of a complex engineering system. Another term: 6 Sigma is used to describe “99.99966%” safety: This means if Enbridge built 1,000,000 pipelines, only 3.4 of them would ever produce 1 leak. If one takes the lifetime operation of Northern Gateway ( 50 years? I am not sure ) and it never leaks once, then Doug Ford is honest. Seeing as the Kalamazoo pipeline leaked Tarsands, you should ask him to show you the math he uses for his marketing. I am sure Doug is a mathematician, first, right? An excellent piece! Your call for sweet reason is rare and refreshing. An O.S.C. is just what is needed. PMSH is unlikely to be supportive, (Neither would Benito Mussolini have been) but Premier Redford seems more likely to go for a cooperative solution as you are suggesting. What a great post Franke! Always a pleasure to read you. I’ll share your posting on FB – it should be of interest to my students. 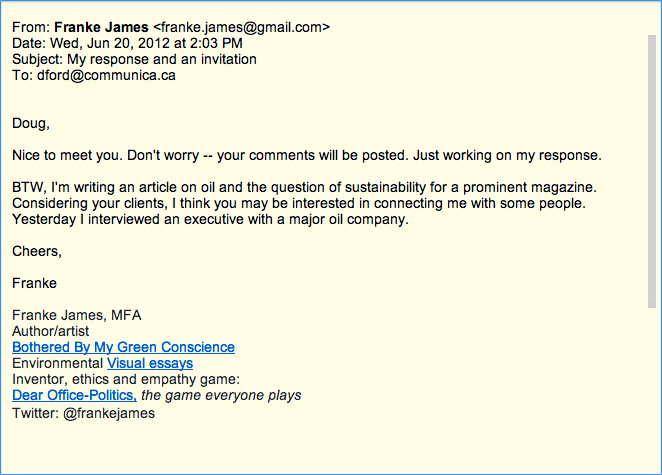 And I’ll look forward to your Corporate Knights article. Please keep up the good work, there are no doubt more people that read you and appreciate your writings than you know! Franke, if the Harper regime had known what it would unleash when it put the brakes on your European art tour last summer, I bet they would have thought twice. 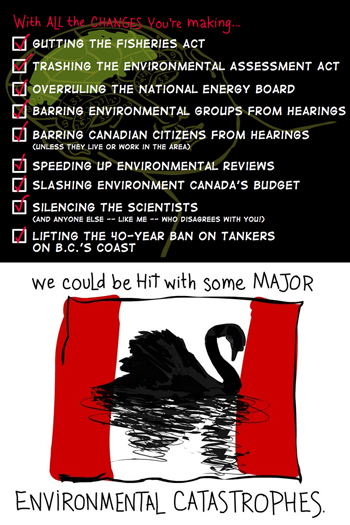 These days, I’m sure they wish you were over there, instead of stirring up the nasty tar sands nest over here, educating/alerting people to what’s really going on in Alberta and with our federal govt. Nice response to a (yet another) PR push by the industry! Great post. I like the way you handled Ford. Great post, and marvellous idea about an O.S.C. model. Involving multiple stakeholders to build consensus is exactly what Canada needs. Hopefully, this would stave off this unfortunate climate we now find ourselves in, of polarized positions, where many (people from various backgrounds) feel threatened, and the facts are getting obfuscated, by cheap marketing and lobbying from special interests.